Looking to really set yourself apart as a Chicago Cubs fan? End your search by adding this Pin 59FIFTY fitted hat to your selection of gear. 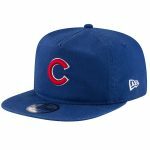 Not only do you get to wear the classic Chicago Cubs cap, but the hat itself gets to wear a pin of a Chicago Cubs hat as well. It’s Chicago Cubs hat-inception!